Blood Blister In Broken Nail Grows Out And Heals Over 5 Month Period; How Does The Thumb Regenerate? The thumb is arguably the most important part of the human hand. Considering the fact that it’s opposable, it has offered us a distinct evolutionary advantage over most other mammals. The thumb has a unique structure and is comprised of nine muscles that help define its movement. 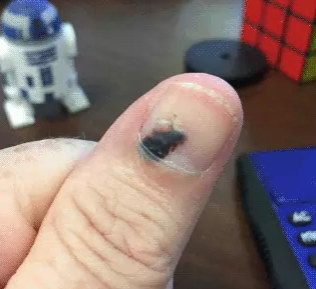 That said, the thumb’s healing ability is also quite incredible, as shown by the below GIF depicting the gradual regeneration of a thumbnail’s blood blister. Over the course of five months, the dark brown or blackish mark slowly creeps up, growing out from under the nail. Blood blisters — otherwise known as subungual hematoma — are typically caused when a fingernail or toenail gets crushed in a door, or slammed in some way. After an injury, or sometimes after wearing tight shoes for a lengthy amount of time, tiny blood vessels break and blood collects underneath a toenail. A pool of blood underneath a nail can create pressure, and thus pain from that pressure, which usually occurs during the first few days following an injury and can be eased by icing the finger or toe. For the next several months, your thumb or fingernail will look much worse than it feels. The nail will continue growing out from the matrix, where each new nail begins to grow, pushing the old cells — and the subungual hematoma — upward. According to the American Academy of Dermatology (AAD), fingernails (especially your thumbs and bigger fingers) grow faster than your toenails. So next time you slam your finger in a door, don't worry too much about the blood blister caught underneath your nail — it's actually pretty cool to see it heal.